"An Amazing Course! As a scientist, I learned a great deal about people skills." "Excellent! Conflict management is a tricky business, but David made it interesting and simple and provided very useful tools." "Empowering! Provides tools to cope with the different personalities in the workplace." 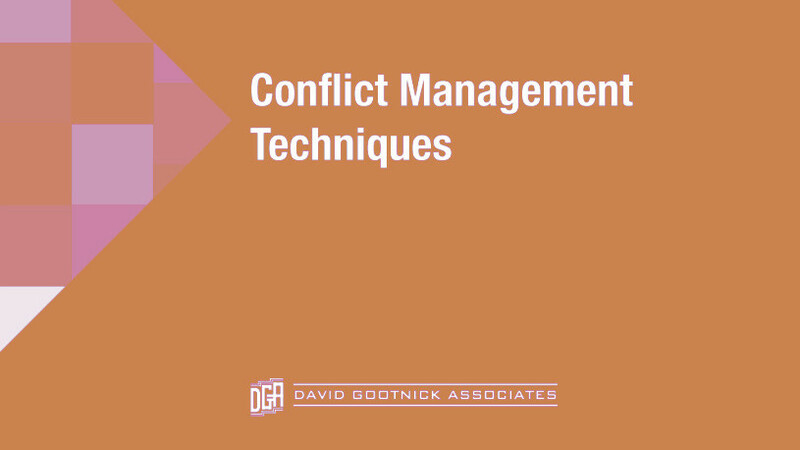 "David Gootnick is a ‘Conflict Management’ Master!" "Excellent! Far exceeded my expectations." "Fantastic Course! A standard of excellence!" Have additional questions? Feel free to Contact us at any time! Learn how to alleviate destructive conflicts and negativism in your workplace and instead encourage positive morale that helps foster a high performance environment. Do not let interpersonal conflicts and workplace negativism get you down. There is relief! In fact, most of the destructive conflicts that we experience can be prevented or eliminated by understanding their causes and applying the appropriate conflict management techniques. During this important workshop, you will master the skills of conflict management. You will also build a comprehensive conflict management tool chest for alleviating conflicts in your workplace and rekindling positive morale that fosters a high performance environment. Disagree when necessary without being disagreeable. Technical professionals and leaders who desire productive relationship and a positive work environment and who want to minimize the conflicts and negativism that drain personal and organizational energy. A highly interactive course with active role playing, simulations, and conflict problem-solving sessions, along with immediate feedback and coaching. Interested in learning more about our on-site short courses? Feel free to contact us for additional information. Copyright © 2019 David Gootnick Associates. All rights reserved.